For me ice cream season never ends! Next week I’ll be cooking at a Thai inspired dinner party, and because no one is waiting for a heavy dessert after all the good food and drinks, I was thinking to serve this ice cream with black sesame. Black sesame flavor is commonly used in Asian desserts, it is unique in the way that it changes the dynamic of a dessert completely. 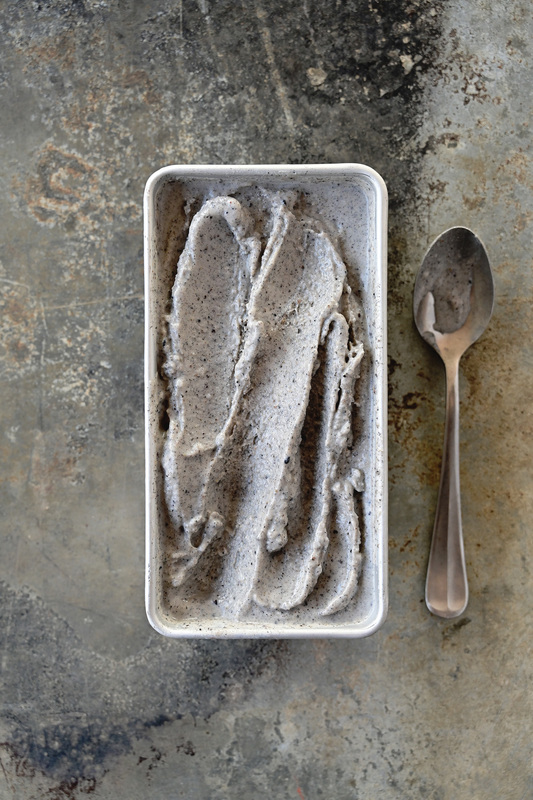 This black sesame no-churn ice cream is easy to make and has a peculiar grey color. Each melting bite has an unusual creaminess and will surprise you with a rich nuttiness. It is almost impossible to find a peer to compare. Spectacular. This is probably my new favorite ice cream! 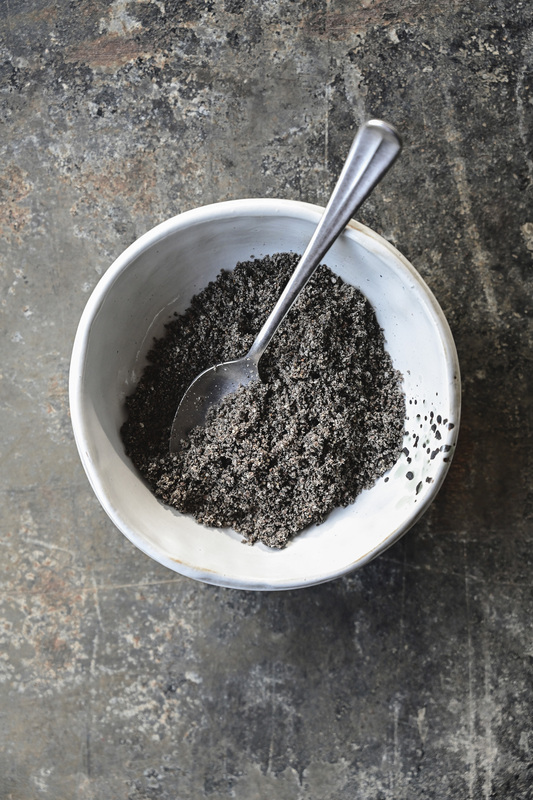 Toast the black sesame in a skillet over medium heat, while stirring constantly, for about 3-4 min, until they start to smell nutty. Transfer to a blender immediately and grind them util sticky. Add condensed milk and salt, mix. Carefully open the can with coconut milk, scoop out the thick coconut fat, leaving the watery part in the can. Beat until stiff. Combine with black sesame mixture. Pour into a container with a lid and put in the freezer for 4 hours. Serve with roasted coconut flakes and enjoy! I recommend serving sesame ice cream on the day of preparation. Ice cream frozen for more than 12 hours should be removed 15 minutes before serving. What a beautiful colour. I haven’t tried black sesame in a dessert but I’d love to. thanks Cat, I tried it for the first time, it’s incredibly delicious! I can imagine that this is absolutely delicious! I love the taste of sesame but I’ve never tried it in ice cream before. I always struggle to know what dessert to serve with Asian dinners and this ice cream looks fantastic. Pinning it for later, Anna! thank you Julia, hope you’ll love it! thank you so much! it’s not that easy, right? glad you like it, I highly recommend it! 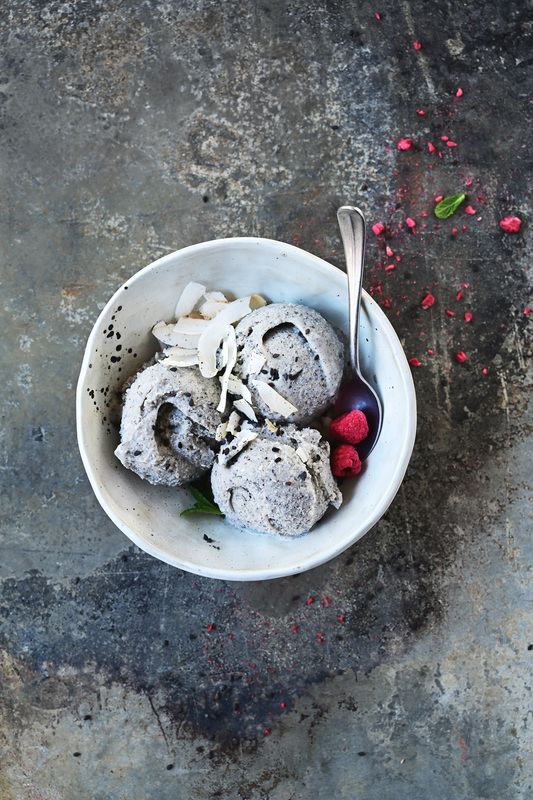 The black sesame certainly adds a sense of drama to this ice cream. It’s so visually striking. I think this is the ideal dessert to serve after a Thai meal.